Have a question or two about our Learning and Assessment products? Here are the most frequently asked questions for your viewing. Have an uncommon question? Feel free to contact us here. Find out and read about CRITERION and SAT. What is the TOEFL Primary test about and how can it help you? The TOEFL Primary test is the new assessment from ETS that helps you shape young students’ English-language instruction in a way you never had before. They are designed for students ages 8+ and measure the English skills that provide a foundation for students’ future success. Why should my child be evaluated? As parents, we want our children to be strong in languages especially in English as it is a global language. In order to help our children improve linguistics capabilities, we need to know their strengths and weaknesses. Therefore a reliable evaluation is the first step to success. What benefits can my children have? The TOEFL Primary scores are mapped to Common European Framework of Reference (CEFR) levels to give students the ability to see their level on a global scale and to let teachers have a more in-depth understanding of their students’ English proficiency. Teachers will be able to place students into respective classes that match with the students’ ability, to enhance the learning experience. The Lexile score of the students enables teachers and parents to find books that suit the student’s English proficiency level, to facilitate learning. What is the cost for a TOEFL Primary test? For enquiries about the pricing, please contact us at 6438-6900. How are TOEFL Primary scores used? Who are the users of the TOEFL Primary? What skills do the TOEFL Primary measure? The TOEFL Primary program offers three tests that measure a range of skills. The Reading and Listening tests (Step 1 and Step 2) assess students’ knowledge, skills and abilities to fulfill core communication goals in English. The Speaking test measures English-language speaking proficiency. How is the TOEFL Primary scored? Both of the TOEFL Primary Reading and Listening tests are scored locally by ETS Preferred Network offices and feature fast turnaround times. TheTOEFL Primary Speaking test is scored at ETS by ETS-trained raters. TOEFL Primary Reading and Listening test — Step 1 scores are determined by the number of questions a student has answered correctly. There is no penalty for wrong answers. The number of correct responses in each section is converted to a level of 1–4 Stars and a scale score of 101–109. TOEFL Primary Reading and Listening test — Step 2 scores are determined by the number of questions a student has answered correctly. There is no penalty for wrong answers. The number of correct responses in each section is converted to a level of 1–5 Badges and a scale score of 104–115. Some students may receive 1 badge and a scale score of 100, and these students are recommended to take Step 1 for better information about their proficiencies in English reading and listening. The TOEFL Primary Speaking test is scored by ETS-trained raters. On the TOEFL Primary Speaking test, students can earn levels of 1–5 Ribbons. Scores of 0–27 are also reported to show progress within a level. How do I know which TOEFL Primary test is right for my students? The Reading and Listening test — Step 1 is intended for students in the earlier stages of English. The Reading and Listening test — Step 2 is intended for students who have acquired some communicative English skills. The Speaking Test is intended for all Reading and Listening test takers. What research is in progress on the TOEFL Primary? Like all tests in the TOEFL® Family of Assessments, the TOEFL Primary are based on thorough research to ensure their validity and reliability, and they reflect best practices in language testing. Does the TOEFL Junior tests Speaking and Writing? TOEFL Junior are available in 2 testing modes. 1) TOEFL Junior Standard has only speaking and writing test. Where/how do I register for the test? Register for a new account or log in with an existing account > click bookings > select TOEFL Junior under available test schedule> fill in your particulars> select payment method > click book. You will be advised at least 1 week in advance. Can I reschedule the test date? Based on case-to-case basis and upon approval. Approximately 7 to 10 days after test date. Connectere will mail you the score report. How do I order more score reports? Extra score report costs SGD$15 each. Certificate of Achievement (Gold/Silver) costs SGD$15 each. Can I get the score report earlier? A fee of SGD$30 is payable for express scoring. You will receive your score report within 3 working days. It is recommended that scores not be used beyond two years. However, scores can be considered valid beyond two years if the test taker provides evidence of having maintained the same level of English language learning. The TOEFL Junior Standard test is not a “pass/fail” test. You are not expected to answer all of the questions correctly. The test is designed to be a tool that measures improvement over time. What to do on the test date itself? Bring along your passport or identification document with your photo in it. Reach the venue at least 15 minutes earlier before the start time of the test for registration. How can I improve my scores? Become familiar with the test format and how to mark your answers on the answer sheet. You can then focus your attention on the questions themselves, rather than on the format. Immerse yourself in the language as frequently as possible and in as many ways as possible. Reading, watching TV and videos, listening to recordings, taking an English course, and speaking to others in English are some of the ways to practice English. How does Criterion help you in essay writing? Criterion is able to evaluate the essay flow as a whole. It gives them immediate diagnostic feedback and more opportunities to practice writing at their own pace. Therefore, students can practice writing at any time of the day as long as they have an internet connection. How does Criterion benefit teachers? Criterion captures the basic errors in Articles, Preposition,Ill-form verbs,Subject-verb agreement and much more. Students are alerted to the errors and correct them before the teacher goes in to finish up the marking process (lightening marking load). As it is a program , it will always capture the same errors even when it is marking the 100th script as compared to a human marker who may have already tire out. Lastly, the teacher can keep track of students’ past,current and draft work. How does Criterion benefit students? Criterion captures the basic grammar errors and provides help in explaining each error in the form of the Writer’s Handbook. It teaches independent learning. The programme can be assessed at home or any place as long as there’s internet access, therefore, students can do writing practice at anytime and anywhere. Does it use American or British spelling? Teachers can select either British or American spelling. Topics in Criterion Topic Library are divided into different modes: Descriptive, Expository, Persuasive, Narrative or Instructor Topics. Instructor Topic means that teacers can create their own topics. There are about 25-29 Topics in each grade (4-12) which is divided into the 4 modes above. Can I create my own topics? Yes you can create your own topics. You can also get Criterion to give your own topic a holistic score. What is Criterion usually use for in schools? b) As an additional writing practice tool to teach independent learning. c) As a first line of marking so that students can edit some basic errors before the teachers come in to finish marking the content. Yes it is easy. We will walk you through the process. Will there be training session for teachers? Yes there will be training session for teachers. What is the accuracy of Criterion? Criterion accuracy is probably about 60-70%. Some errors can’t be captured or are captured in error due to the clumsy writing style. What other features are there in Criterion to aid students in their writing? (Examples: Idea Tree; Idea Web:Compare and Contrast etc). d) Writers’ Handbook ( Errors like Fragments; Ill-formed Verbs; articles etc are explained to the students). e) Comments and dialogue features to communicate with teachers or their peers. f) Teachers can create peer group work where a selected group of students will work on a similar topic and they can have group discussion via comments and dialogue. Please click here to check for upcoming test dates and to register for SAT online. Contact us for registration and test dates. What are the next SAT Reasoning and Subject test dates in Singapore? Please visit CollegeBoard website for more details. How many subjects can I take per sitting? The maximum subjects you can take in one sitting for SAT Subject tests is THREE (3). Should you wish to take more than 3, the other subjects must be taken on a different date. SAT Reasoning and SAT Subject tests cannot be taken on the same day as they start at the same time. The maximum ‘Language with listening test’ you can take per sitting is ONE , and in November Only of each year. Those sitting for the listening test in November must bring along a portable CD player with earphones. Where are the test centers in Singapore? Are they opened for every test date? Do log in to your SAT online account. Go to the page where you can select test centers. Indicate country as “Singapore ” and the various test centers will be posted for you to choose. How do I do an online registration? Please right-click on the link ( Online registration ) above and choose ‘Save Target As /Save Link As…” to save the file. *Note that this website is managed by College Board USA for the whole world and we have no access to the database. 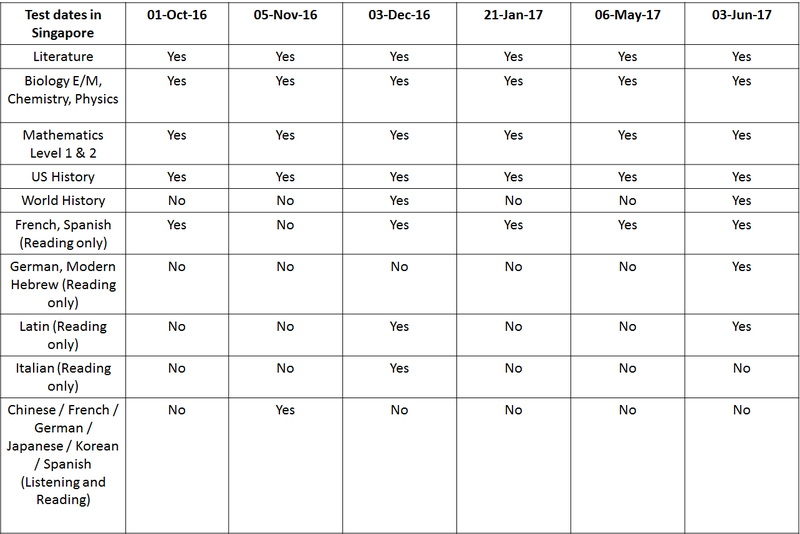 Are all subjects available for every test date? I need to sit for reasoning/subject test on a particular test date even though registration is closed,how can I do it? You will have to register for the next available test date. Standby testing and late registration is not available in Singapore. When can I know my results? Your scores are available online 3-4 weeks after test date. Please refer to College Board website www.collegeboard.com for announcement of results release dates. Note: The paper score report you receive cannot be used for application to universities. Universities need the Official Score Report which is sent directly by College Board USA to the universities concerned. For those who have indicated their choice of universities in their SAT Online account (no later than 9 days after test date) the official score report will reach them 5 weeks after the test. Those who submit after 9 days will take more than 5 weeks for score reports to reach the universities. Official score report is sent by College Board directly to the universities without going through you. What is the validity period for SAT scores? Validity period are set by individual universities. Most universities accept 2-3 years, some even 5 years. Please check directly with the universities. Are there SAT Reasoning sample tests I can try? For SAT Reasoning sample test , click this link: Sample test download click here. What time do I report for the SAT test? Test takers must arrive at your selected test center latest by 7.45am for registration. Test proper will commence between 8 to 8.30am. For a list of things you need to bring, refer to your admission ticket. What is the format of the SAT ? 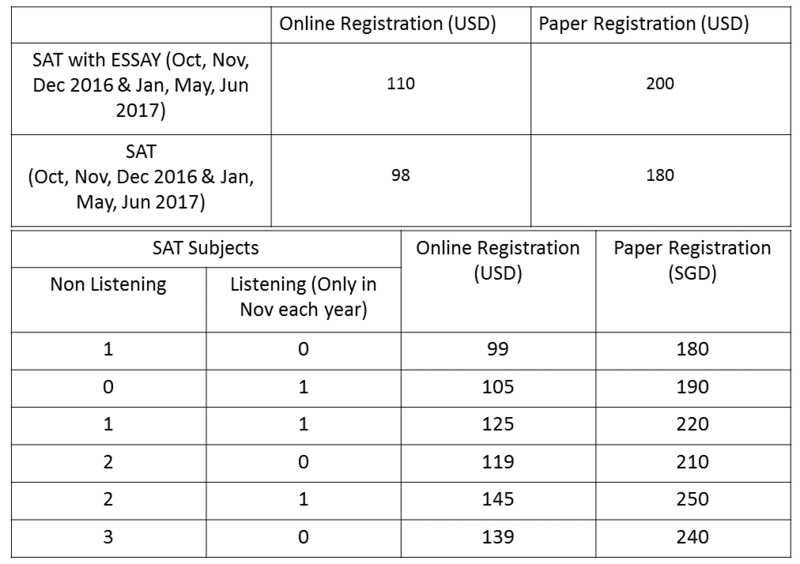 The difference between the old and new SAT format? Each section is strictly timed. You are not supposed to attempt questions from other sections while you are in a particular section. If you are caught, you will be expelled from the test center. How are scores for SAT derived? Your answers are scored by computers using a software specially developed by ETS. You get one point for each question that you answer correctly. You don’t lose any points if you skip a question. For those who signed up online and have printed out the admission ticket, the things to bring are listed there too. Where can I buy study materials for SAT Reasoning? The official SAT Study Guide is sold at our office at $39 per copy. The guide provides your first look at the redesigned SAT – direct from the maker of the test. It comes with explanations and strategies for dealing with SAT Reasoning test and contains real SAT sample tests and official answer explanations. Can I cancel my test and get a full refund? There is no refund for test cancellation. You can transfer your registration to a future test date. Test date changes can be made via your SAT online account. A credit card is required for this service as there is a charge for test date changes. What type of calculators are acceptable for SAT testing?